Tecserv is considered to be one of the first fire and security solutions specialists to embrace the use of radio technology by installing wireless fire alarm systems. We remain at the forefront of using this technology and are proud to say we install and maintain radio fire alarm systems for some of the UK’s leading schools and universities, hotels, and owners of popular heritage buildings as well as many businesses. Wireless fire alarms are often preferred because they are cable-free. Using wire free technology can be particularly appealing in heritage or protected buildings because it means their integrity can be preserved and appearance not spoilt by miles of unsightly cabling between detectors, sounders and the main control panel. Instead radio frequency waves are used to transmit data. Wireless installations are suitable for most larger commercial building applications such as schools, universities, office complexes, hospitals and warehouses. Using radio fire alarm technology is an increasingly popular option as it can significantly reduce installation time, reduce cabling cost and avoid too much disturbance on new-fit as well as fire alarm installation upgrades. How does a Wireless Fire Alarm System work? 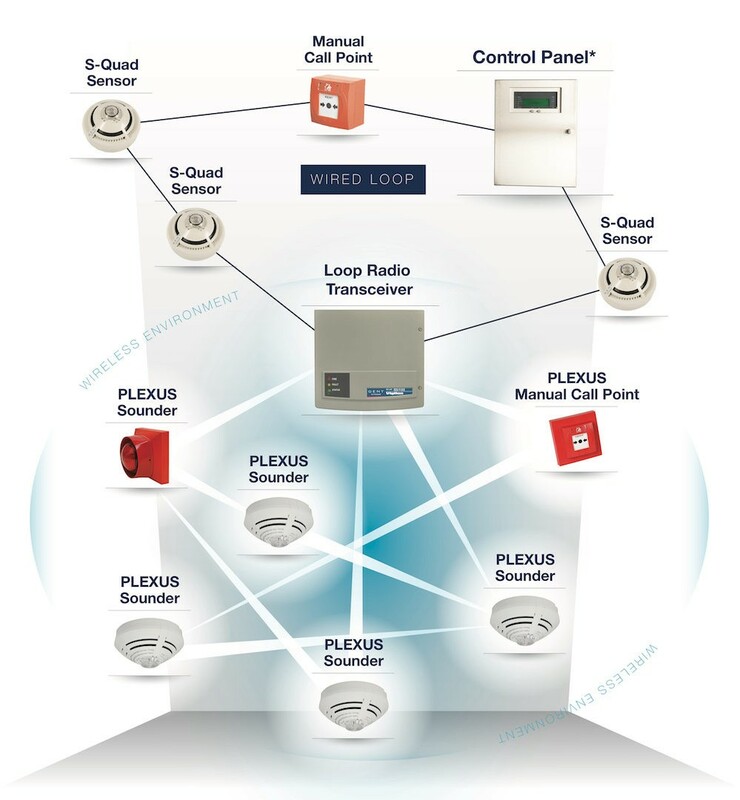 Wireless fire alarm systems work in much the same way as addressable fire alarm system, but instead of signals being transmitted by wiring, they are sent by radio-frequencies to a main control panel. Each detector has its own address which means that should a fire be detected the location of that specific detector is displayed on the main control panel ensuring pinpoint accuracy on the location of the fire and the area to be evacuated. This also helps to cut down on disruption and avoid full building evacuations because alarm sounders will be activated only in the area triggered by that specific detector(s) this is dependent on how the cause and effects are set.This can be particularly beneficial in the event of a false alarm activation as a brief visual inspection can verify whether the trigger is an actual fire. What are the advantages of a Wireless Fire Alarm System? We have a qualified team of technical specialists and support engineers who are able to expertly design a system that is tailored to suit your particular building. If you would like more information on radio fire alarm systems or would like to book a free survey, please call our sales team on 01773 764 726 or complete the enquiry form.